On www.dangl.at you will find up to date informations about astronomy and spaceflight in more than 9.200 files. The contents of my web pages are measurement data, tables, text, images and videos with results from my astronomical work. The capture, processing and forwarding of scientifical data is the main part of my astronomical work. I am pleased that more than 200,000 interested annual visitors from over 140 different countries and several continents are using the contents of my web pages. The amount and contents of this site will be currently expanded. So periodically visits should make sense. As a member of the International Occultation Timing Association / European Section, the VdS Fachgruppe Kleine Planeten and the Österreichischer Astronomischer Verein, I stay in constant contact with many astronomers in Europe and on all other continents around the globe during my astronomical work . My astronomical work with a scientific background are, the detection of stellar occultations by asteroids and the Earth's moon, astrometry and photometry of asteroids, comets, and spacecrafts, follow-up astrometry of newly discovered near-Earth objects, video astrometry on fast moving asteroids, transit curves of exoplanets, mutual occultations and eclipses of planetary moons, detection of flare events of highly active stars, images of supernovae, meteor showers and a few other astronomical areas. Through the self developments of devices for measurements of camera systems and astronomical time measuring devices, it is possible for me to analyze such systems for other astronomers from all over the world. The measured data are then made available to all astronomers around the globe. Results from my astronomical work are presented at conferences with presentations to international experts and are issued also in numerous scientific papers. 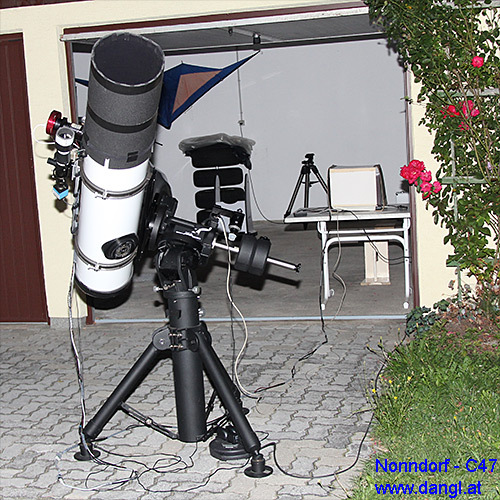 With it in Nonndorf currently measurements and analysis are made on devices for astronomers around the globe. You want to participate the observing of sky objects? Interested people are welcome on an observing night in the Woodquarter! All you need is interest and warm cloth for cool nights. All used tradenames and trademarks on this site belong to the individual owners. I assume no liability for visiting this site and using the contents of my pages.